Last week we reported on Frazr, one of Germany’s many Twitter clones (if you’re eager for more side-by-side comparisons, see Sloggen, Wamadu, Faybl or 1you, which all launched in March or April). Frazr is symptomatic for the state of Web 2.0 in Germany and to get a better understanding for the many international developments, this post starts a series of regional profiles on Web 2.0 around the world. I’ll start the tour with a closer look at Germany, home to Europe’s largest population of internet broadband users. Just as this week’s Pew Internet Study stirred a debate on the view of Web 2.0 in the US, Germany has seen similar arguments on the size of the phenomenon locally. For a long time, several indicators had hinted that Germany was falling behind in broadband penetration compared to other European countries like Sweden or Norway. But a recent OECD study painted a very different picture: looking at the total number of households (as opposed to per-capita penetration), Germany comes out on top in Europe with 14.1 million subscribers in December 2006 (followed by the UK at 12.9 and France at 12.7 million). So the crowds are here, but where can they go? “Web 2.0” is a term that brilliantly translates around the world, but many of the sites that are commonly associated with it have a language barrier for international audiences (take MySpace for example: it officially launched its German version only in March of this year). While English certainly isn’t foreign to Germans, it has still slowed their adoption – and network effects, which have been a driving force, are often tied to language and reach as well. What’s been the consequence in Deutschland? A mushrooming of German copycats that have localized and copied their US role models, sometimes down to the last pixel. Whether you’re looking for social bookmarking, photo sharing, video posting or a college social network, Germany’s clever entrepreneurs have done the translation for you and some even fared quite well. 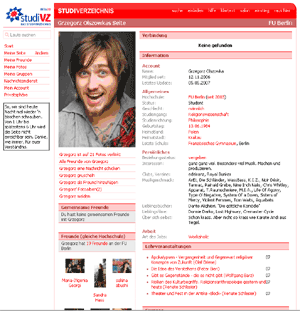 The best example by far is StudiVZ, whose name stands for “student directory.” Launched in October 2005, it now claims to house 2.1 million users. Despite a myriad of security problems and controversies, new users kept coming in, which only speaks to the universally strong demand for such networks among students. In January of this year, Germany had its mini-YouTube moment when StudiVZ sold for €85M ($100M) to the German media conglomerate Holtzbrinck Group. If the screenshots look familiar, you won’t be surprised to hear that StudiVZ’s early versions of the site were using filenames like fbook.css or poke.php. (Facebook was in talks with StudiVZ but it walked away because of scalability and security concerns about the platform. Instead, Facebook is now working on its own strategy – let the battle begin). Another success story is Xing (formerly OpenBC), a professional network like LinkedIn. In December 2006, it became the first Web 2.0 company to go public and is now traded at the Frankfurt stock exchange. Xing’s rapid growth among the German business community came rather unexpected after it launched in November 2003, especially in a country that isn’t typically known for its culture of business networking. The site now boasts 2 million members and about 13% of its users pay for a monthly premium subscription of €5.95. With revenues of €10 million in 2006, Xing’s performance at the stock market has been somewhat lackluster and the real test for the company will come as both Xing and LinkedIn expand beyond their original markets (LinkedIn now has 9 million registered users and $10 million in 2006 revenues; it recently raised $13 million more). Of course there are creative and innovative startups to be found (and growing any multi-million user base is a feat in itself regardless). For some inspiration, take a look at our previous coverage of Plazes (currently a sponsor) and SellABand; last week also saw the launch of MindMeister, a promising online mind mapping collaboration tool. Other notable services include blauarbeit.de, a growing reverse-auction site for jobs and services, and we have yet to wait for a successful US counterpart. In short: Germany is buzzed right now and the biggest question for the startup scene is how the many look-alikes will develop over the next year. You’ll often hear that investors are hesitant to invest in ideas that “haven’t been proven in the US yet” but there are several other factors at work here: Germany is generally more risk-averse, the bureaucracy is more cumbersome, and entrepreneurial networks like Silicon Valley aren’t as strongly developed. Nonetheless, the country’s business angels and media conglomerates (Holtzbrinck Group, Burda, Axel Springer) are eager to invest with rapid-fire pace at the moment but the majority of German internet users have yet to be convinced that there is a land beyond eBay, Google, Wikipedia and some online news sites. Meanwhile, German and other European startups are in a prime position to tinker with mobile applications and I wouldn’t be surprised to see more innovation in this space soon. The continent is covered with advanced data networks and the UK has already seen the introduction of flat-rate data plans at reasonable prices. Germany’s market is sure to follow and the boon of the mobile web will start in Asia and Europe sooner than in the US. You also want to watch out for innovations around IPTV as subscriptions are expected to reach 2.6 million in Germany alone by 2010. Curious fact: Google’s market share for search is near 92% in Germany. And yes, it’s a verb here, too. Gregor Hochmuth is an analyst and entrepreneur in residence at Hasso Plattner Ventures. He runs zoo-m.com and his own homepage at dotgrex.com.